Control Room: 033 - 2262-5370 /5374/5379(FAX). •	The Government Railway Police is a separate branch of General Police force and is enrolled under Act V of 1861. •	There are 44 Railway Police Stations (GRPSs) and 84 Railway Police Posts (GRPPs) of the four Railway Police (GRP) Districts of Sealdah, Howrah, Siliguri and Kharagpur. •	Has a force of about 3341 personnel as on March, 2018. •	Covers area across 4000 Kms of Railway tracks which have 715 Railway Stations and Junctions through which almost 3,000 trains originate/pass through or terminate and on an average 4.5 million passengers travel through this State. •	Headed by a Director General of Police assisted by one Inspector General of Police and one Deputy Inspector General of Police. •	Has 04 (four) sections headed by Superintendent of Police. •	Phone or meet the officer on duty at the nearest GRP Police Station / Post. •	Meet any gazetted officer or phone him. •	Contact GRP HQ at Kolkata on phone 033-2262-5370/5374/5379 (FAX), Control Rooms Howrah GRP District: (033) -2641-3256/3096/4217(FAX), Sealdah GRP District: (033)2556-8726/(033)2528-5349/ (033)-2532-4523(FAX), Kharagpur GRP District: 03222-226924/228044/ 03222-227938 (FAX) and Siliguri GRP District: 0353-2432770 / 0353-2432770(FAX). 3. To enquiry into accidents on railway. 4. To render assistance to railway officers and to the travelling in so far the rendering of such assistance is compatible with their own duties as Police Officers. The Govt. Railway Police are responsible for the prevention and detection of crime on railways. Anti –sabotage check to prevent explosions. The Railway Police came into being in Bengal on January 1, 1867 to prevent theft, robberies and numerous other crimes committed on East India Railway which was operating in the Bengal Presidency consisting of not only the present day State of West Bengal in the Indian Union but the other States of Bihar, Jharkhand and parts of Odisha and Assam besides Bangladesh. However, realizing that the Bengal Police was protecting the property of commercial railway firm, a committee in 1872 commended separation of the railway police into two distinct parts, one for performing traffic duties and the other for carrying watch and ward duties. The latter has evolved into Railway Protection Force under the Ministry of Railways, Government of India. Government Railway Police (GRP) was further reorganized consequent to the recommendations of the second Police Commission of 1902-03. Post independence, the West Bengal Railway Police has been functioning as a branch of West Bengal Police within the purview of Police Act V of 1861; it’s functioning being guided broadly in terms of Police Regulations of Bengal, 1943. Initially it was headed by an officer designated as DIGP (Traffic & Railways), West Bengal with the office located at 9/1, Hungerford Street, Kolkata – 700017. 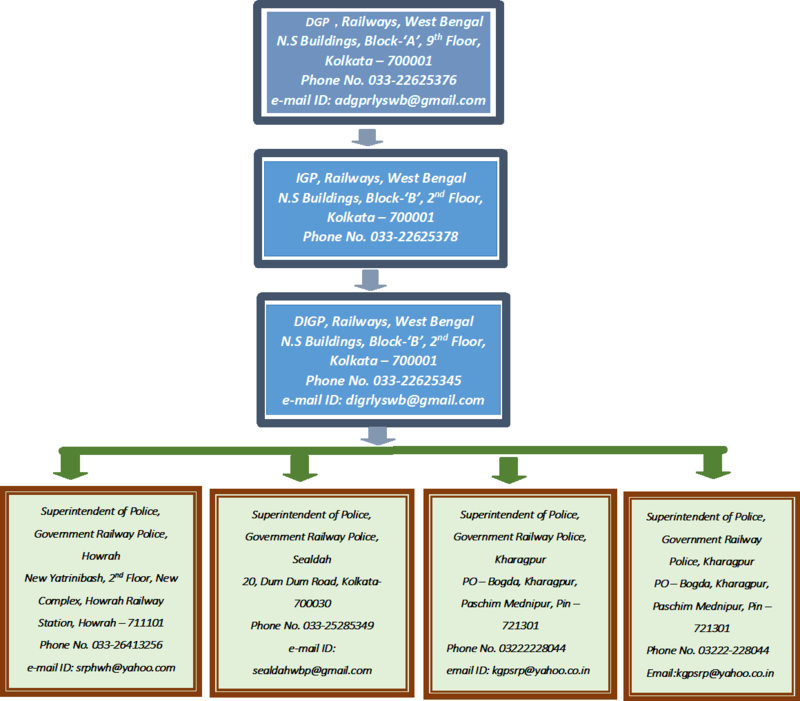 In the year 1990, the post of IGP, Railways, West Bengal was created with the office at the same premises. The year 2000 marked the separation of Traffic from Railways as a separate establishment in West Bengal Police and creation of the post of ADGP, Railways, West Bengal who started functioning with effect from 16th June, 2000 with office at ‘Shantiniketan Building’, 8, Camac Street, Kolkata. In may, 2013, entire Railway Police establishment was shifted to ‘New Secretariat Building’ at 1, Kiran Shankar Roy Road, Kolkata – 700001 and set up as ‘Government Railway Police Headquarters, West Bengal’ as an Integrated Headquarters headed by the Additional Director General of Police, Railways, West Bengal. He is assisted in his tasks by the IGP, Railways, West Bengal who heads the Railway Police Zone and DIGP, Railways, West Bengal who is the Range DIGP for Railway Police in West Bengal. In West Bengal has nearly 4000 Kms of Railway tracks which have 715 Railway Stations and Junctions through which almost 3,000 trains originate/pass through or terminate and on an average 4.5 million passengers travel through this State, on 454 Mail / Express / passenger trains and 465 Local Trains every day, it is very important aspect of ensuing mobility through this strategically located Frontline State which has International boundaries with three South Asian countries and the entire North Eastern Indian being connected through it. This is achieved through the 44 Railway Police Stations (GRPSs) and 84 Railway Police Posts (GRPPs) of the four Railway Police (GRP) Districts of Sealdah, Howrah, Siliguri and Kharagpur. The sanctioned strength for this Branch of the State Police is 5570 while the actual manpower available at the end of March, 2018 was 3341. The concerned Zonal Railways have to bear the cost of 50% of the cost of employment upto the rank of SRP. Besides the Crime and Accounts Sections, this Hqrs also maintains a Railway Police Control Room to effectively coordinate the functioning of the 04 GRP District and their field units as well as to timely disseminate information to the senior officers of this Hqrs to enable them discharge their functions effectively. It also helps in the liaison and coordination with RPF and Railway authorities.